But from time-to-time we like to change it up and visit the big city and take advantage of all the amenities and comforts it has to offer. 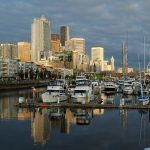 This was just the situation recently when our float plan had us stopping at Puget Sound’s largest metropolitan cities: Seattle, Tacoma and Olympia. is operated by the Port of Seattle. 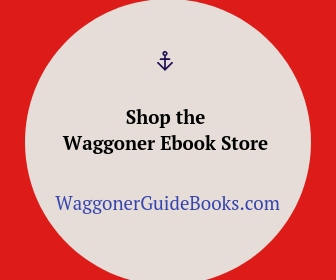 The area offers so many fun things to do and see, along with places to eat. Once Easy Goin’ was secure in her assigned slip we headed into town for some provisions and sightseeing. 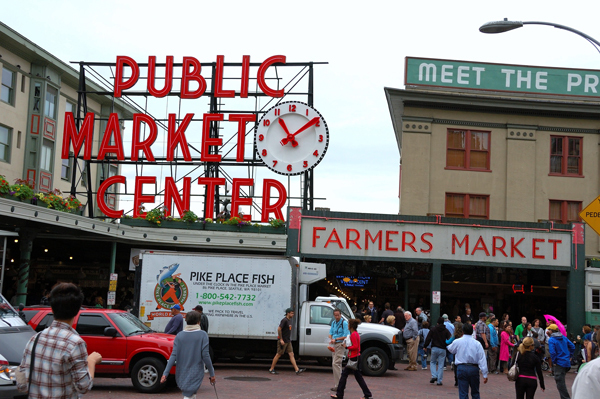 A visit to the Emerald City, by land or sea, would not be complete without visiting Pike Place Market, which is just three blocks up the hill from the marina. 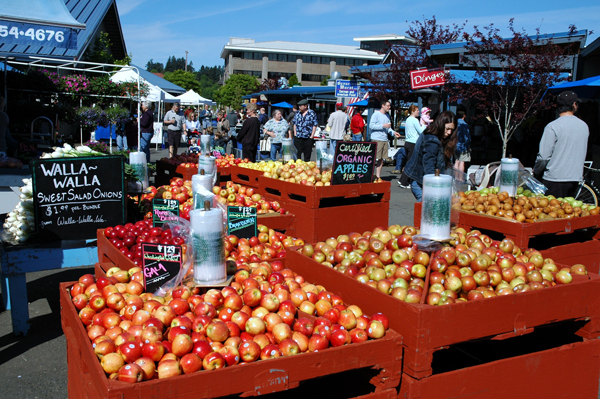 The market, which got its start in 1907 and covers nine acres, is one of the oldest continually operating markets in the nation and is an ideal spot to sample regional foods or gawk at the colorful booths and shops selling local fruits, vegetables, preserves, cheeses, seafood, flowers, arts and crafts. 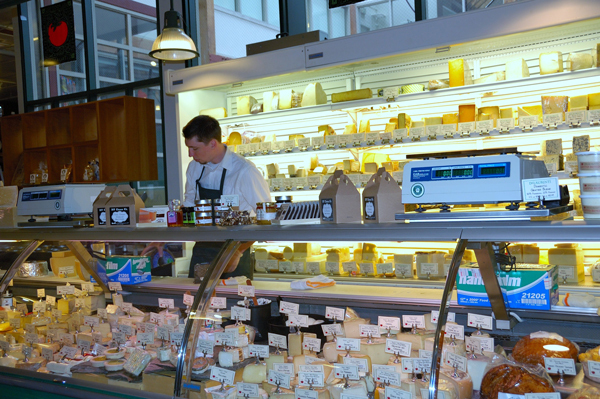 The market also has several international restaurants, cafes, food bars and street musicians entertaining throughout. Some say Seattle is fueled by coffee. Starbucks got its start in Seattle with the original store located in the market. On any given day people are lined-up out into the street for a cup of Joe from where it all began. Just a couple blocks east is Westlake Center, a glass-fronted multilevel shopping mall that anchors the pedestrian Westlake Park and is surrounded by a vibrant retail district. Macy’s and Nordstrom, the upscale chain’s flagship store, as well as scads of national-brand stores can be found in the surrounding blocks. Just north of the Pike Place Market is one of the city’s trendiest club and nightlife scenes. Belltown has an extraordinary number of eateries and live music venues, which range from the classy Dimitriou’s Jazz Alley, the epicenter of Seattle’s jazz and blues scene, to The Crocodile, the historic home base of many start-up bands including Nirvana, Pearl Jam and R.E.M., for hip-hop, punk, electronic and more. Beecher’s Homemade Cheese. We had a wonderful time visiting, and watching the sun set over the Olympic Mountains before walking up to Anthony’s for dinner. The plan for the following day was to explore more of the area so we grabbed our walking shoes once again and headed south along the waterfront. 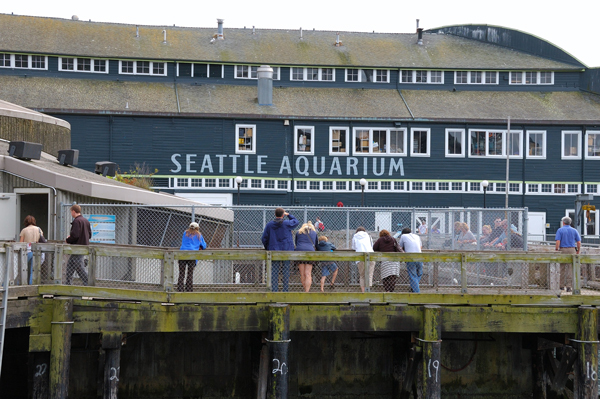 The Seattle Aquarium, one of the largest aquariums in the nation, showcases marine life from the northwest and beyond. Waterfront Park offered additional views of the area and downtown from atop two viewing platforms. The park’s fountain sprayed a welcome mist on strollers in the hot summer weather. 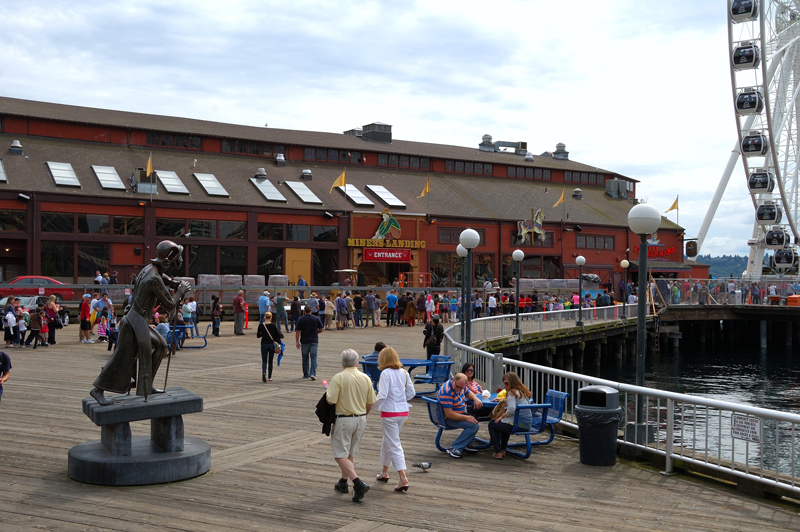 Pier 57 is the home of Miners Landing, arcade games, an indoor carousel, restaurants and where you’ll find the Seattle Great Wheel, a 175-foot tall Ferris wheel that offers birds-eye views of the Elliott Bay and downtown. 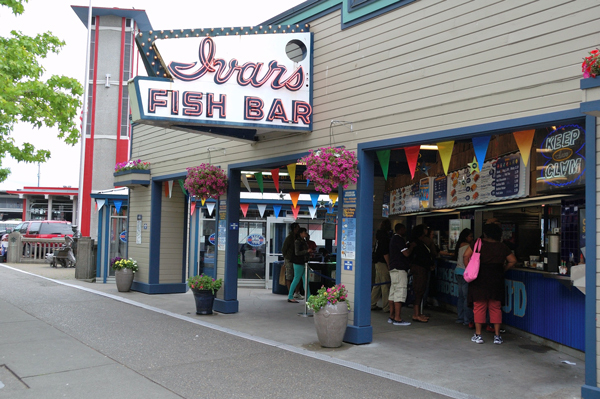 Next to the ferry terminal is Ivar’s Acres of Clams, founded by Seattle impresario Ivar Haglund. 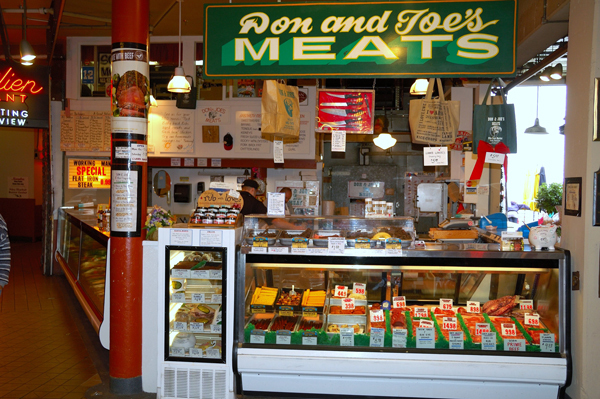 It’s a Seattle institution known for its fish and chips and clam chowder. Beyond is Seattle’s stadium complex which include T-Mobile Park (Mariners) and CenturyLink Field (Seahawks and Sounders), which draws legions of sports fans on game days. We want to time one of our visits so we can attend a game or two. 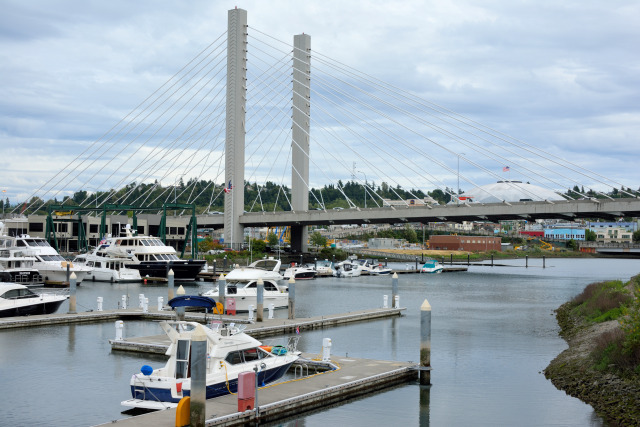 The next morning, we said our good byes to the helpful and courteous Bell Harbor Marina staff and set a course for Tacoma’s Dock Street Marina, 25-miles to the south. 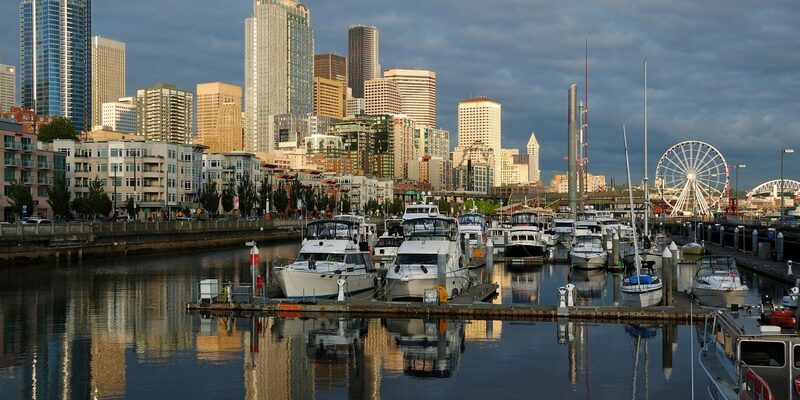 Dock Street Marina is nestled in the heart of downtown Tacoma on historic Thea Foss Waterway and just steps away from world class museums, fine dining, exciting nightlife and a long list of shops and boutiques. We arrived just before noon and there was a friendly wharfinger standing ready to lend a hand with the lines. Our assigned slip had a wonderful view of the southern end of the waterway, a suspension bridge with its 180-foot towers and the Tacoma Dome. During our check-in the staff provided us with a welcome bag filled with coupons, maps and other gifts from local merchants. We found the staff happy to provide suggestions, make dinner reservations and share local information to make our stay enjoyable. Strolling north from the marina along the waterfront esplanade there is a mixture of shops, galleries, condos and restored warehouses. 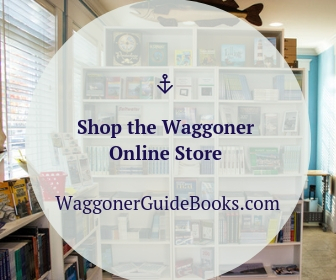 This is where you’ll discover the Foss Waterway Seaport, a working waterfront maritime museum. The Museum is housed in a timber frame warehouse built by the Northern Pacific Railroad nearly a century ago. Visitors enjoy many hands-on exhibits demonstrating piloting skills, displays of vintage motors, and demonstrations on boat building techniques. 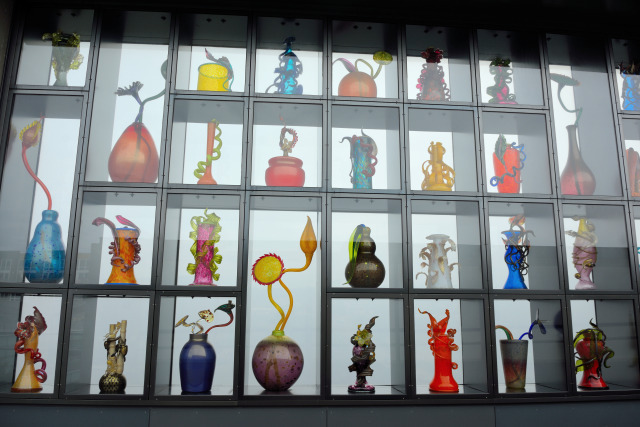 The Museum of Glass, located at the head of the dock, focuses on the medium of glass within the context of contemporary art. Its 90-foot silver dome represents some of the history of the area by replicating the forest industry’s wood burner domes that once dotted the region’s landscape. 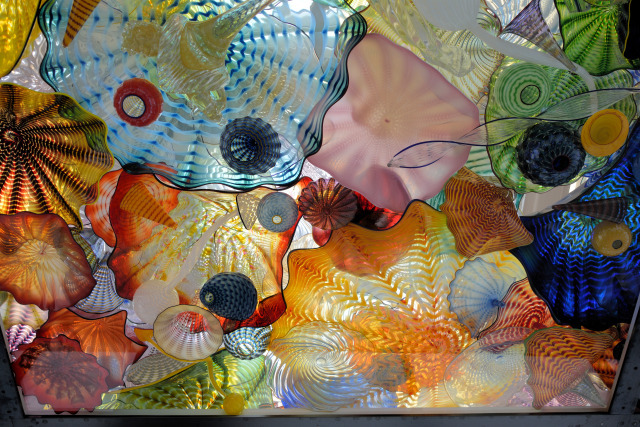 West of the Museum is the spectacular 500-foot Chihuly Bridge of Glass linking the waterway. 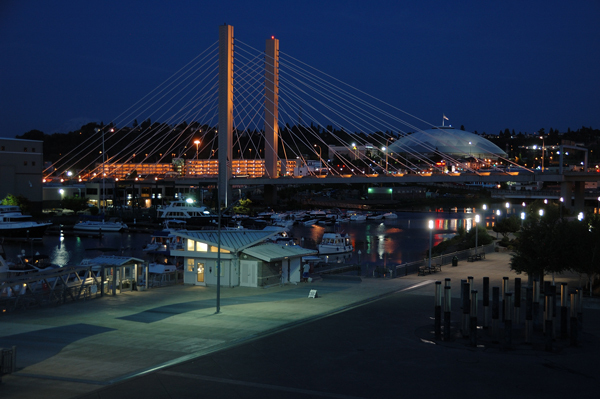 The bridge highlights the largest collection of Chisholm glass in a permanent outdoor exhibit. Once across the bridge, you’re in the center of the “Museum District” in the heart of downtown. Here, we discovered two more museums forming an impressive triangle of cultural attractions within a city block of each other. The Washington State History Museum features interactive, multimedia and storytelling exhibits on the state, its people and places. It also contains the largest collection of pioneer, Native American and Alaskan artifacts on the Pacific Coast. 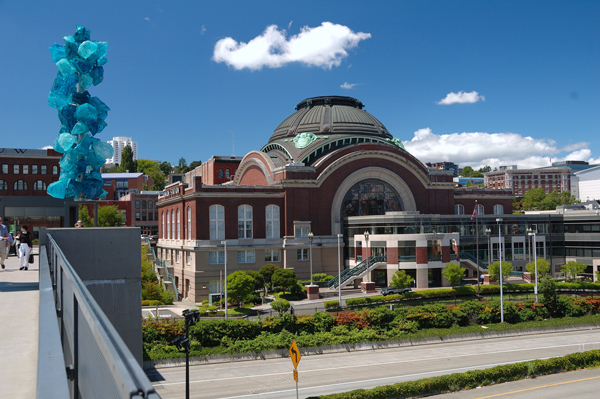 Completing the Museum District triangle is the Tacoma Art Museum located to the north. Its mission is to connect people through art. 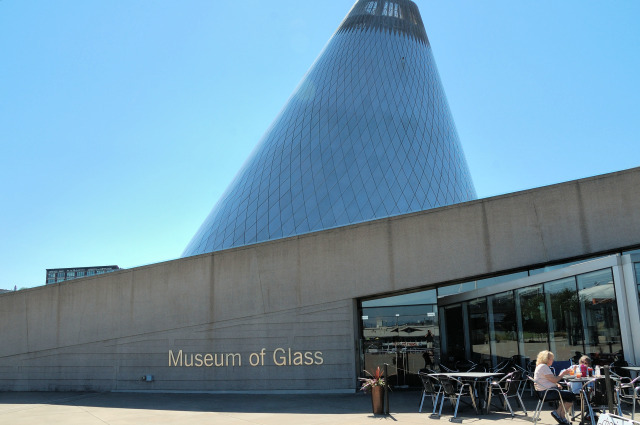 The museum serves the diverse communities of the Northwest through its collection, exhibitions, and learning programs, emphasizing art and artists from the Northwest. 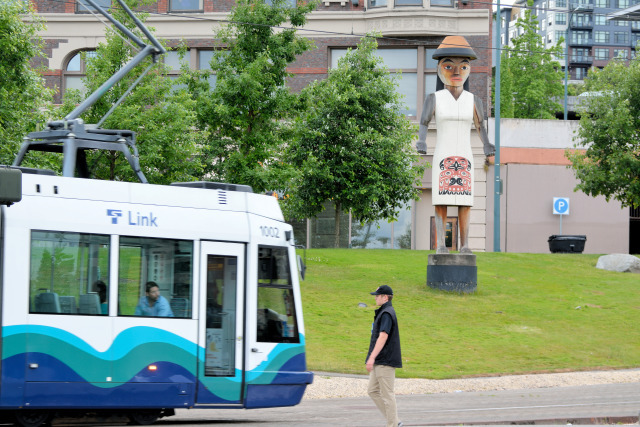 Getting around the downtown area is easy with Tacoma Link. The free light rail link connects the Tacoma Dome District at the south end of town with the Theater District on the north end and runs every 12-minutes along Pacific Avenue, just hop on. The Tacoma Dome District is where you will also find the Lemay – America’s Car Museum spotlighting America’s fascination and love affair with the automobile. The museum on a nine- acre campus features rotating galleries, a 3.5-acre show field, theatre, café, banquet halls, meeting facilities, racing simulators and slot car racing. Exhibits feature 350 automobiles from Ferraris and Corvettes to Model Ts and the LaSalle 303 Roadster. After a day of viewing art, absorbing the history and culture, and shopping checkout the fine dining in the area. For a special treat, a table at El Gaucho, Johnny’s Dock Seafood, or The Melting Pot are perfect choices in the heart of town. For Thai cuisine, recommend a stop at Galanga Thai. Also, you may want to stop by The Swiss Restaurant & Pub or the Harmon Brewery & Eatery for some great brews after your meal. 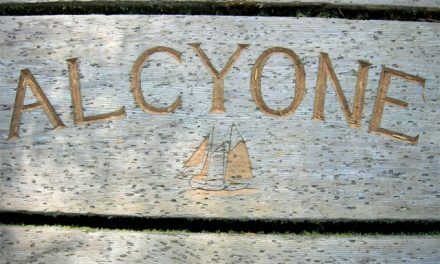 With all that the City of Destiny had to offer a couple days wasn’t enough time to do it all, but we had moorage reservations 35-miles south in Olympia. 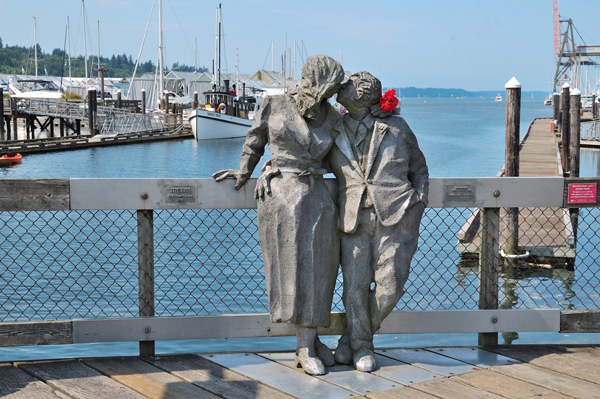 Resting at the foot of 100-mile-long Puget Sound in Budd Inlet, Washington State’s waterfront state capital is an ideal cruising destination or any type of boater. 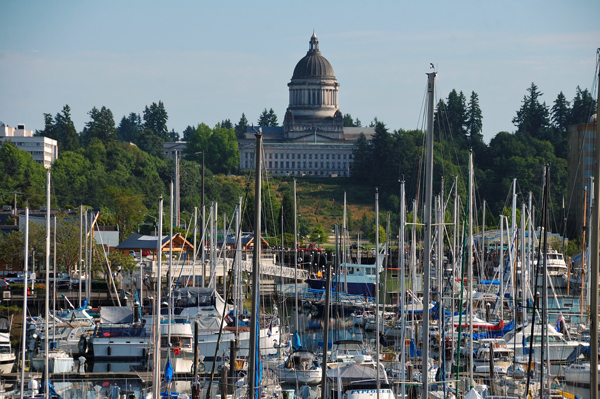 Olympia sits in the shadow of the Olympic Mountains to the northwest and the state’s capitol dome dominates the skyline to the east. 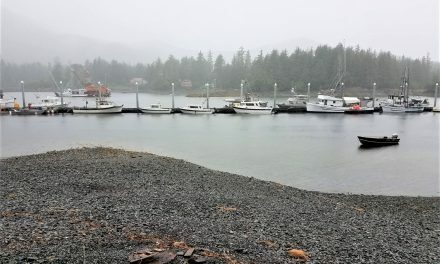 shoaling in Bud Inlet. 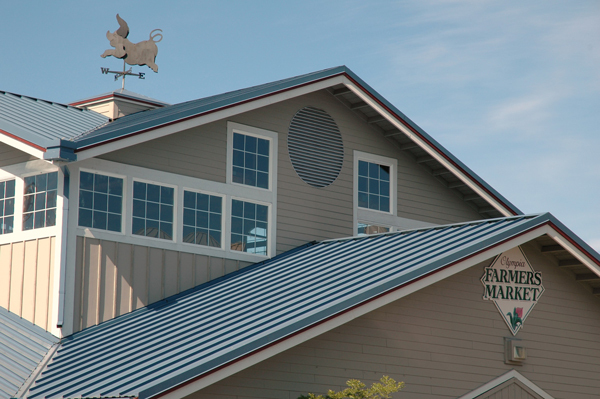 Our destination for this visit was Swantown Marina & Boatworks, located in East Bay. 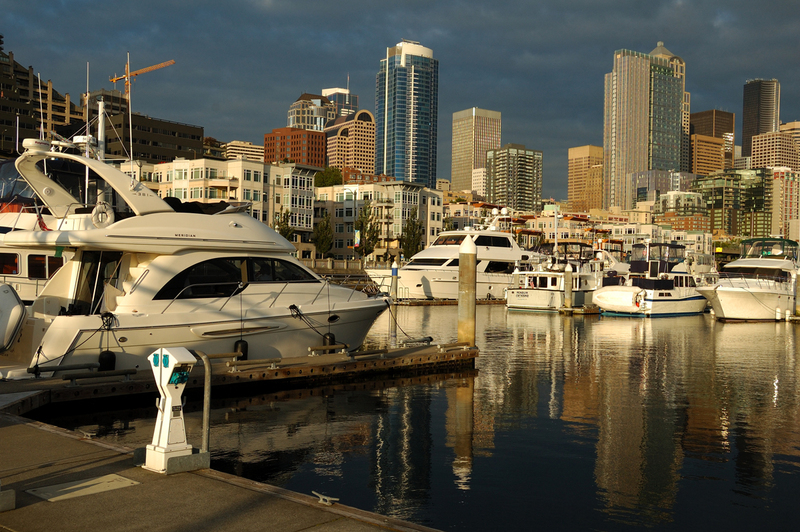 Swantown Marina offers ample guest moorage in a park-like setting. 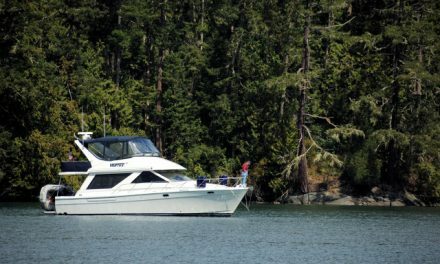 It’s a little further from downtown than Percival Landing in East Bay, but if you’re looking for a quieter moorage and all the marina amenities this is your best bet. 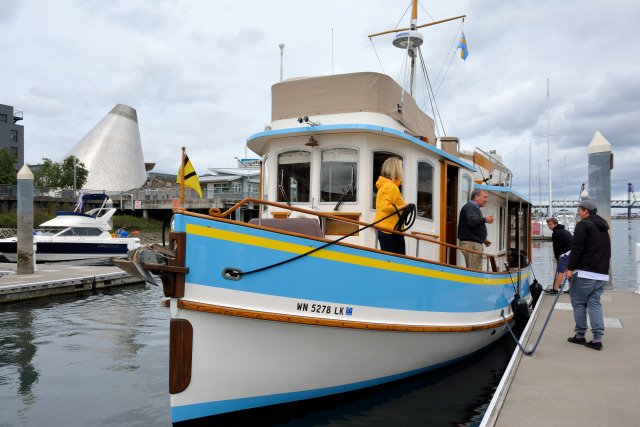 Once we were secure in the slip, we made the short walk to Capitol Way South to hop aboard the free Dash Shuttle, that travels up the hill to the State’s Capitol for a tour. 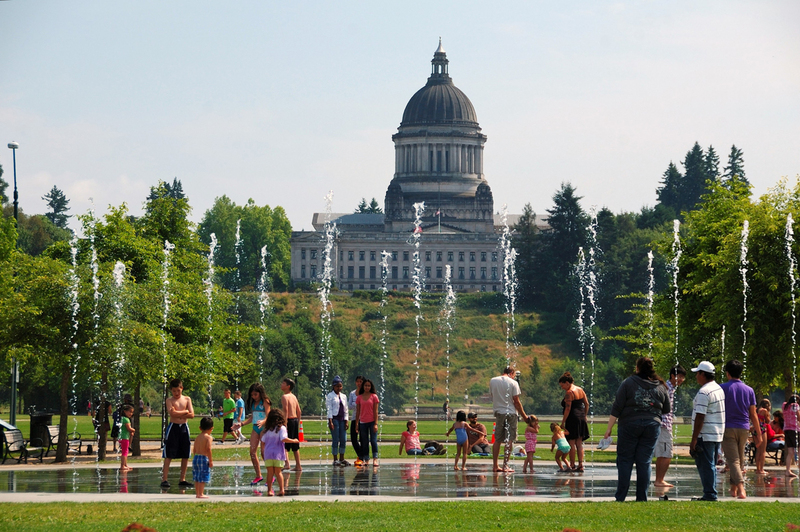 Free guided tours of the Washington State Legislative Building are offered seven days a week hourly, between 10 a.m. and 3 p.m. on weekdays, and between 11 a.m. and 3 p.m. on weekends. The informative tour lasted about 45 minutes and we learned about the building’s architecture, the dome and the massive Tiffany chandelier suspended from it. We also heard about the magnificent colored marble from Italy, France and Germany throughout and visited the legislative wings to hear about the workings of state law. Then it was back down the hill on the shuttle to stroll along the Percival Landing docks and boardwalk. 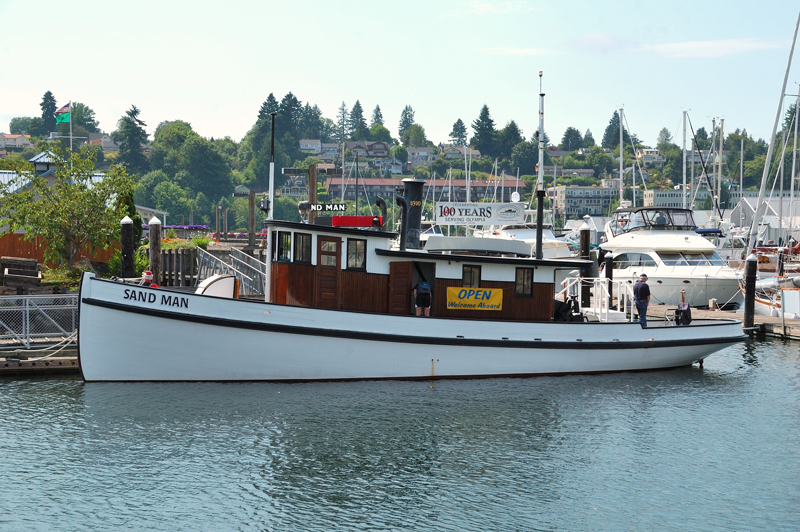 A visit to the landing would not be complete without a touring the refurbished, 60- foot,100-year old tug, Sand Man, which hauled everything from oysters to log barges for much of a century. 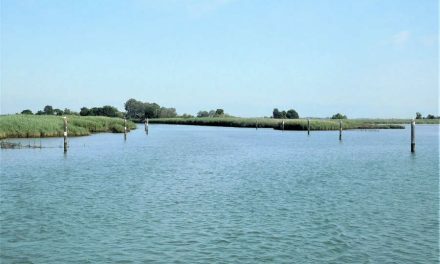 Today, the vessel is operated by The Sand Man Foundation, a non-profit organization and tours. The boat is open to public viewing on the weekend and it’s free. items, flowers, crafts, takeout food and entertainment. The last stop on the way back to Easy Goin’ was at Batdorf & Bronson to sample some handcrafted coffees and watch beans from Africa, Indonesia and Latin America in the roasting process through the large windows in the tasting room. We departed with a half-pound of Organic French Roasted beans. If you’re in need of a refreshment after exploring Olympia, The Eastside Club is all about beer. With 40-plus taps pouring the finest brews from the Northwest and beyond there is something to suit any taste. The pub was the inspiration for Moe’s Tavern on The Simpsons TV show. When in port we enjoy letting someone else do the cooking and the capitol city has no shortage of excellent restaurants and pubs. 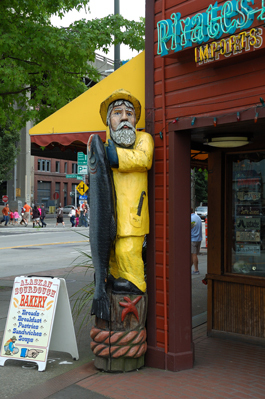 Budd Bay Café is popular for their outdoor waterfront dining and feature an extensive selection of seafood and steaks. Other can’t go wrong options, all within easy walking distance, are Anthony’s Homeport and Hearthfire grill, Dockside Bistro, Gardner’s Seafood & Pasta, Mercato Ristorante and for breakfast it’s King Solomon’s Reef a retro diner with an old-style counter and booths. 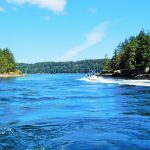 Deane is a freelance writer and photographer specializing in recreational boating and the yachting industry. 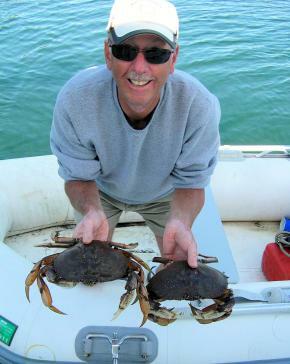 He has over 45 years of Pacific Northwest boating experience. 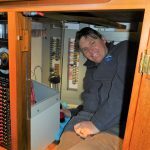 Follow Deane to learn more about boating maintenance and tips, boating destinations, and cruise planning. 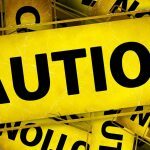 Deane’s work has appeared in 39 local, regional, national and international publications, with more than 470 articles and over 2,000 photo credits.